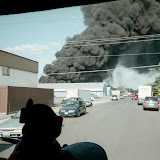 Yesterday, May 26th, 2012, the Spokane Fire Department responded at approximately 6:30 PM to 1113 West York on a reported structure fire. The first crew on scene was Engine 3 from the local neighborhood fire station at Indiana and Ash. The Lieutenant reported a basement fire in a 1-story, wood framed residence. An aggressive interior attack by the first arriving crews confined the fire to the basement while additional fire crews completed search and rescue, ventilation and salvage and overhaul. The fire was brought under control within 30 minutes and there were no reported injuries to the occupants or firefighters. Six fire companies with 18 firefighters responded to this fire and were on scene for approximately 1.5 hours. Fire damage was confined to the basement with smoke damage through out the rest of the structure.